I finally made a successful batch of Healthy Homemade Vegan Sweetened Condensed Milk and could not be more proud! After whipping up a batch and letting it chill in the fridge for a bit, I dipped a spoon in the jar and gave it my first taste test. This stuff is divine. Purely DIVINE. YEARS ago, I promised the vegan readers of this blog that I would, some day, make a Vegan Sweetened Condensed Milk. And that day has just arrived people. I wasn’t expecting my original Sweetened Condensed Milk recipe to be so popular, but it quickly rose to being one of the top recipes on this blog. Since that was the case, I knew I needed to make the vegan version ASAP. This stuff is so sweet and creamy, it’s seriously hard to believe this Vegan Sweetened Condensed Milk is sugar free, low carb, gluten free, paleo, and keto friendly. It’s as sweet as frosting and as creamy as can be! This super easy 3-ingredient Healthy Homemade Vegan Sweetened Condensed Milk is sweet, thick, rich and creamy, yet sugar free and low carb! In a high speed blender (I used my Vitamix), add all of the ingredients. Blend until completely smooth. Store in the fridge in a tightly sealed jar or container. Keeps for ~1 week. If you want a thicker condensed milk, consider adding ¼ teaspoon of Xanthan Gum to the recipe! 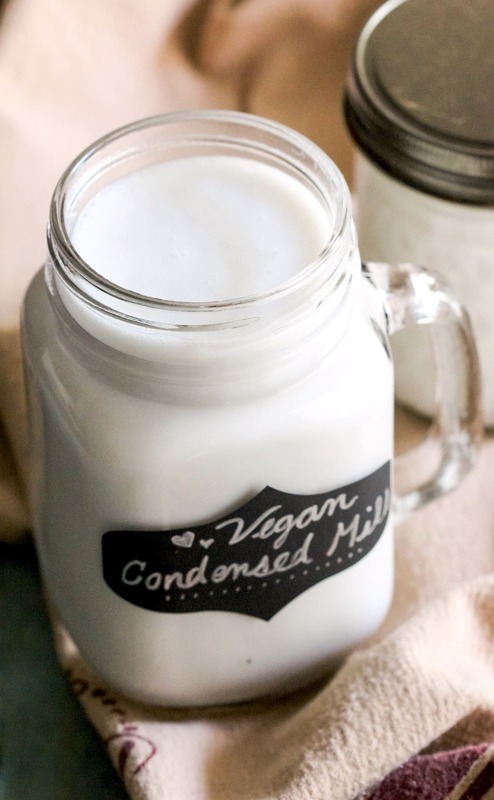 Compared to ¼ cup storebought condensed milk, ¼ cup of this Healthy Homemade Vegan Sweetened Condensed Milk has 180 less calories and a whopping 44g less sugar! You’re saving yourself from nearly ¼ cup of straight up sugar. While this Vegan Sweetened Condensed Milk isn’t as thick and sticky as it’s dairy counterpart, it’s just as sweet and creamy. You’d never know it’s sugar free, low carb, gluten free, paleo, or keto! I could drink this straight up. i wonder if you could sub the Vanilla Rice Milk Powder for 1/2 cup + 1 T powdered rice bran (or just powdered rice, so rice flour) and 1/2 + 1 T cup brown rice protein powder…? Hmmm I’m not sure if that would work… The brown rice flour might add a gritty or bitter texture. I would just try using the brown rice protein powder alone, but start off by adding one scoop at a time to the blender with the milk as it might thicken faster than the rice milk powder. Hope you like the condensed milk Nicole!! 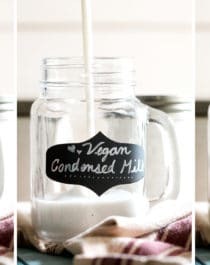 This is great, I’ve been looking for a recipe for vegan condensed milk. I wonder if soy milk powder would work? I kind of hate the taste of it but I would have difficulty finding rice milk powder. Wow! I just made this amazing condensed milk and am having good to hold back from eating it all straight from the blender! Thank you for creating this delicious recipe, it is so quick and easy. Also thank you for having the links to purchase the products, makes it so easy to get what I need sent to Australia. Do you think this would work as an equal substitute to sweetened condensed milk when making ice-cream? I used to adore condensed milk, even though I didn’t have it too often–my mother wouldn’t let me! It’s such a guilty pleasure of mine to want some thick milky sweetness drizzled on top of my treats! Anyways, I love that this take is so much healthier! 1/4 cup is a pretty generous amount of topping too! How long does it keep in the frig? Can I freeze the leftovers? I’m so excited for this recipe – I can’t wait to use it to make the vegan chocolate truffles! I did have one question: is there any way I could use regular stevia with a little bit of vanilla extract instead of the vanilla creme flavor? Thank you for the recipe, though I have to ask – for it to be condensed milk, wouldn’t you have to condense it at some point? It looks like a great sweetened coconut milk, but for it to be a condensed version, you would have to simmer it on the stove to evaporate the water.